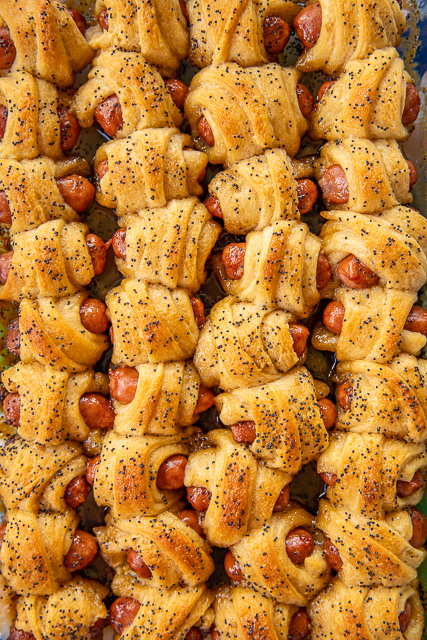 These Glazed Pigs in a Blanket are incredible. 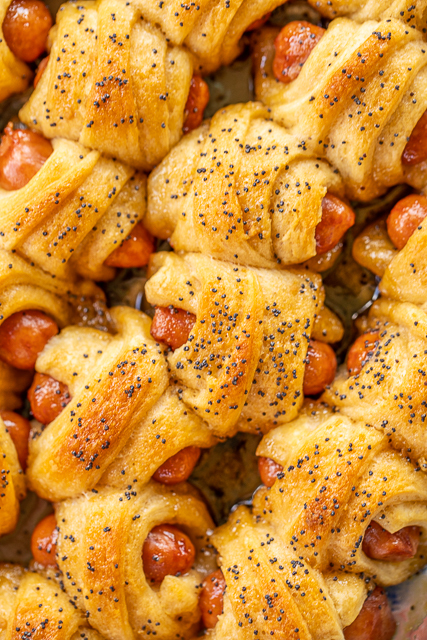 I have a SERIOUS weakness for pigs in a blanket, and these Glazed Pigs in a Blanket are no different. Pigs in a blanket topped with my favorite brown sugar glaze and baked. I can't believe I never thought to make them before. OMG! To-die-for!!! I ate WAY too many of these yummy Glazed Pigs in a Blanket. These ended up being my lunch because I couldn't stop eating them. They are delicious hot out of the oven or cooled to room temperature. Perfect party food. 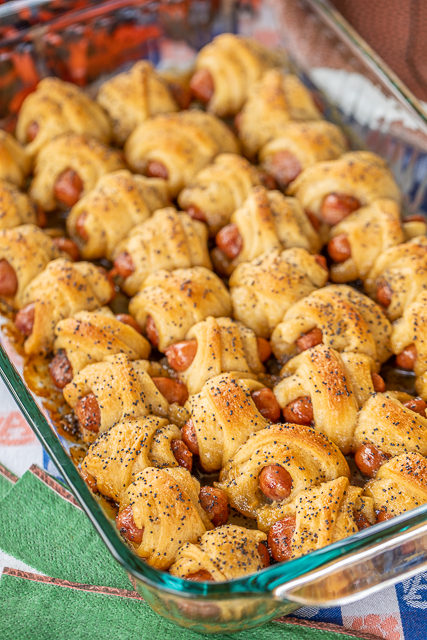 This recipe makes 36 Glazed Pigs in a Blanket. I took these to our tailgate last week and they were gone in a flash. 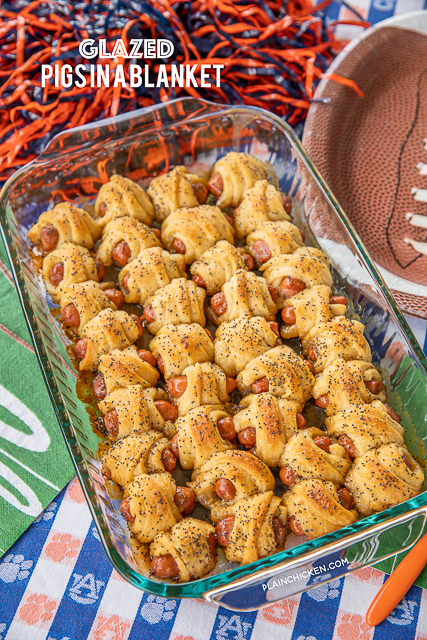 I mean, who can resist sweet and savory sausages wrapped in crescent rolls?!?!? I know I sure the heck can't. I already have a request to bring these to our football party again this weekend. I can promise you these will be on my holiday party menus too! SO good! Unroll both cans of crescent rolls; separate into 12 triangles. Spread a heaping teaspoon of Dijon mustard on each triangle. Cut each triangle lengthwise into 3 narrow triangles. Place sausage on wide side of each triangle. Roll up and place in prepared pan. In a small sauce pan combine butter, brown sugar, mustard, Worcestershire and poppy seeds. 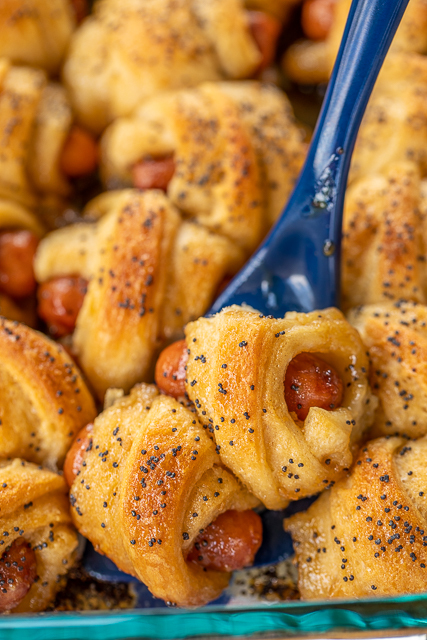 Bring to a boil and pour over pigs in a blanket. Bake uncovered for 25 to 30 minutes, until golden brown. Sounds delicious! I think I will make these for our family camping trip next weekend! Perfect around the campfire snacks! 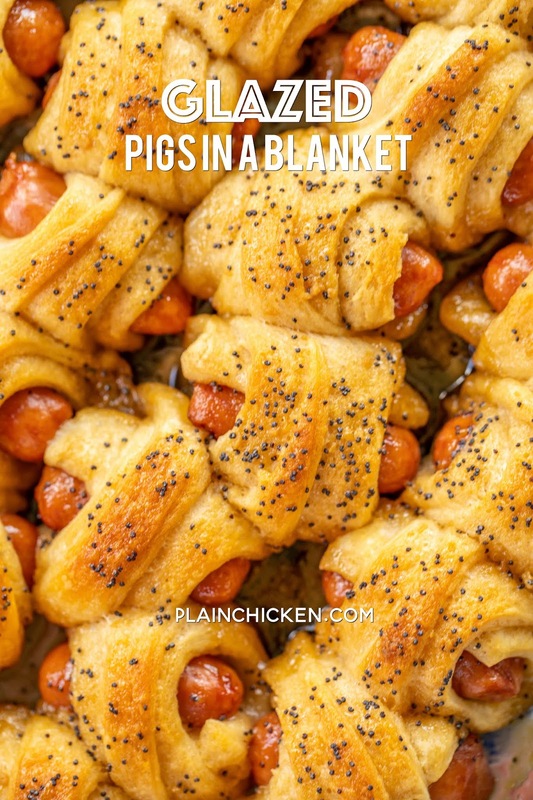 Okay these are the ULTIMATE pigs in a blanket. Wish I had a batch of these right now and it’s 8:30 in the morning! These are on all my party menus from now on! You & me both! These are so good! Enjoy! Any idea if you can get them ready and then refrigerate until time to cook? These could be a quick dinner night if so! Cutting those crescent rolls in thirds was really a challenge. Mine are ready to go in the oven for a trial run. Fingers crossed. Really? I’ve never had an issue cutting the triangles into three. Use a rolling pizza cutter instead of a knife... makes it a lot easier! The pizza cutter is a neat idea --- I've found that the dough is easiest to work with when it's chilled, so I tend to leave it refrigerated until I'm ready to work with it. These sound really good! Do you think these would stay warm and not get soggy in a crockpot? I would like to make them for a wedding shower. I've never tried keeping them warm in the crockpot.